J. L. Herraiz Roda, J. A. Llueca Abella, C.Catalá Masó, Y. Maazouzi, M. Colecha Morales, A. Serra Rubert, D. Piquer Simó, C. Oliva Martí, E. Calpe Gómez. The aim of this study was to assess the feasibility and outcome of laparoscopic surgery in the management of large ovarian cysts in patients treated at a university hospital. Twelve patients with large (diameter >10 cm) ovarian cysts were managed laparoscopically from November 2009 to July 2014. The cystic masses were not associated with ascites or enlarged lymph nodes on ultrasound. Serum CA-125 levels were within the normal range (35 U/ml). Preoperative evaluation included history, clinical examination, sonographic images, and serum markers. The management of these ovarian cysts included aspiration, cystectomy, or salpingo-oophorec- tomy, depending on the patient’s age, obstetric history, and desire for future fertility. Five patients presented with abdom- inal pain and two with abdominal distension and discomfort. In the five patients, the cyst was an incidental finding on a routine review. The average maximum diameter of the ovarian cysts was 25 cm (range 13–41 cm). The mean duration of the operation was 87 min. The postoperative hospital stay was 1– 4 days. No intraoperative complications occurred, and the hospital course of all patients was uncomplicated. 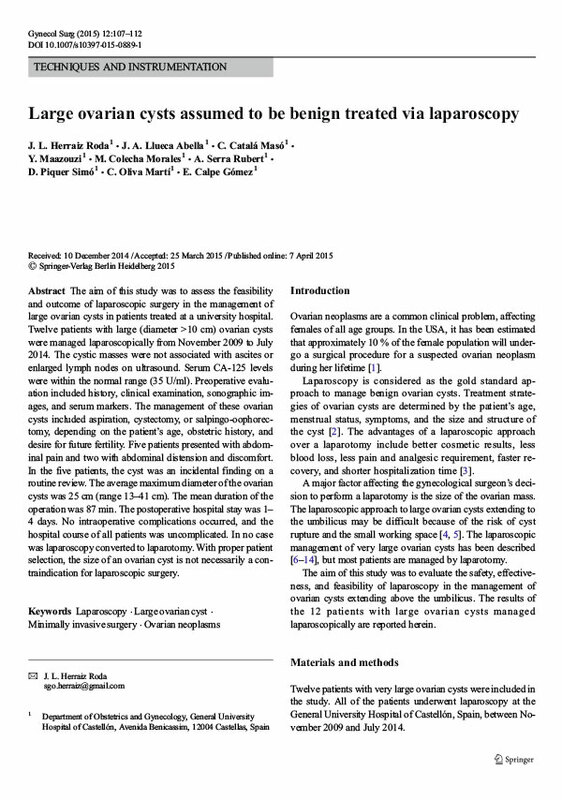 In no case was laparoscopy converted to laparotomy. With proper patient selection, the size of an ovarian cyst is not necessarily a contraindication for laparoscopic surgery.